Today I’m going to share a cute card that I created from a “boo boo” that I made during my Color Your Season Class on Thursday night. 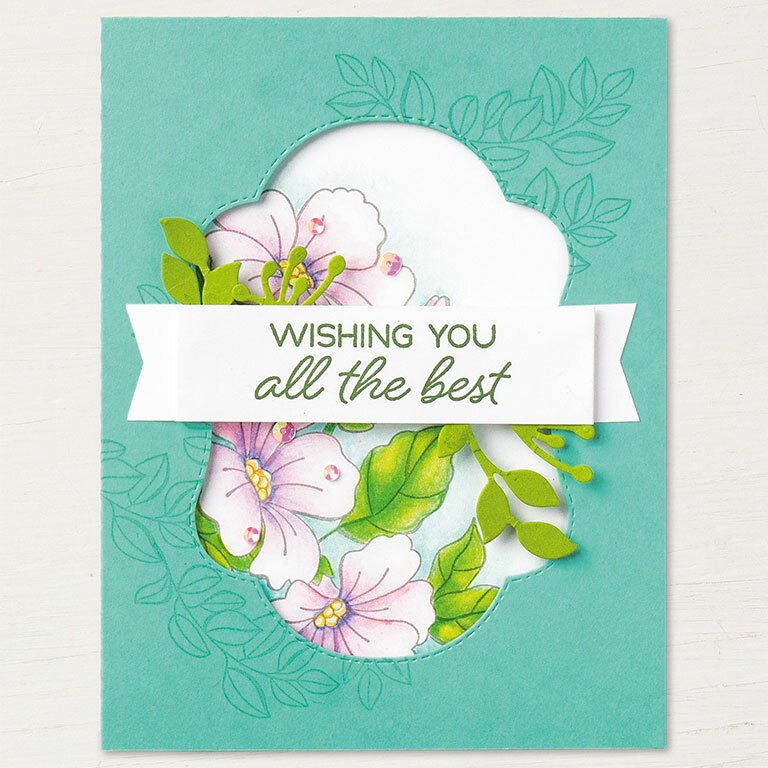 On our first card we stamped the floral image and colored it, on the third card we use two of the dies to create some layers …. however, I cut the die shapes out, out of my floral image Oh my … so I created a form of the eclipse card!! Can you see the beautiful layering? From a boo-boo it turned out pretty cool … lol. My card front it popped up with the dimensionals, the second layer is adhered directly to the base of my card and the center is popped up with the Stampin’ Dimensionals as well… giving this card a very unique look. 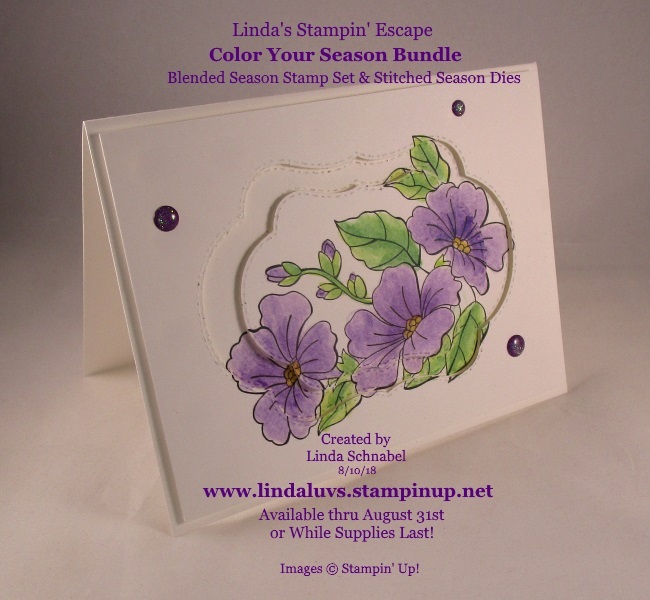 It was created on Whisper White cardstock and was stamped in Momento Ink using the floral image from the Blended Seasons Stamp Set. I used the New set of Watercolor Pencils to color in my image and the blender pen to give it a more watercolor effect. 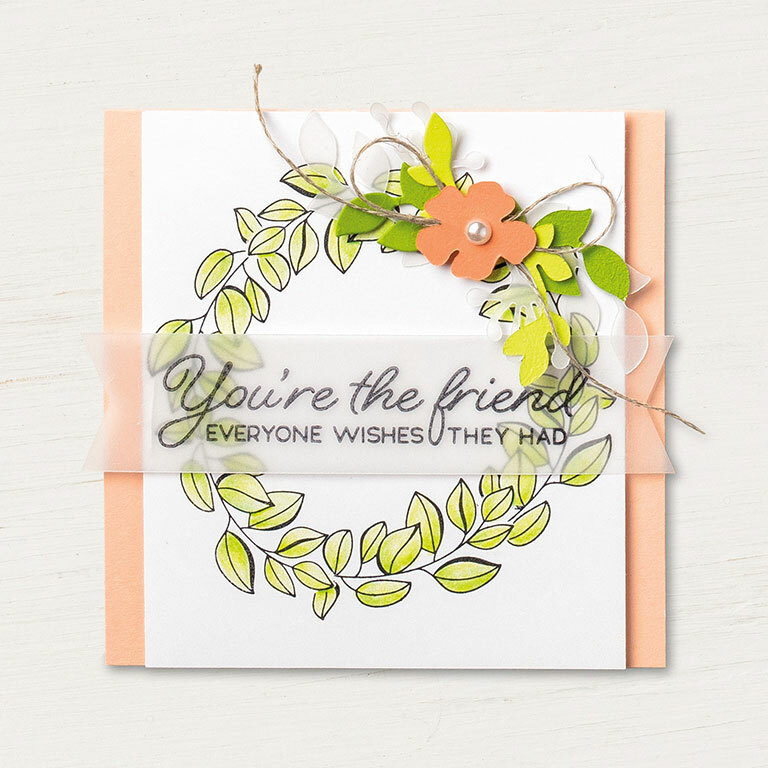 Our class also used the Stampin’ Blends and Aqua Painters to create cards with this bundle and the new Watercolor Pencils (they are amazing) this whole bundle is amazing!! Our colors of the Watercolor Pencils were Gorgeous Grape, Night of Navy, Granny Apple Green and Garden Green. Oh yes, and Crushed Curry for our flower centers. Simply color just like you did as a kid, then use the Blender Pen to soften the look! After layering the pieces I added the new Glitter Dots to the card to take up just a little of the white space. See … there really are no mistakes in stamping, just opportunities unfolding!! Hope you enjoyed todays card and that it inspires you to create outside of the box. Or at least, not to throw your boo-boo’s away!! Thanks for checking in on my today, tomorrow I will share my “Sneak Peek” into the holiday catalog with you. Have yourself an awesome day!! 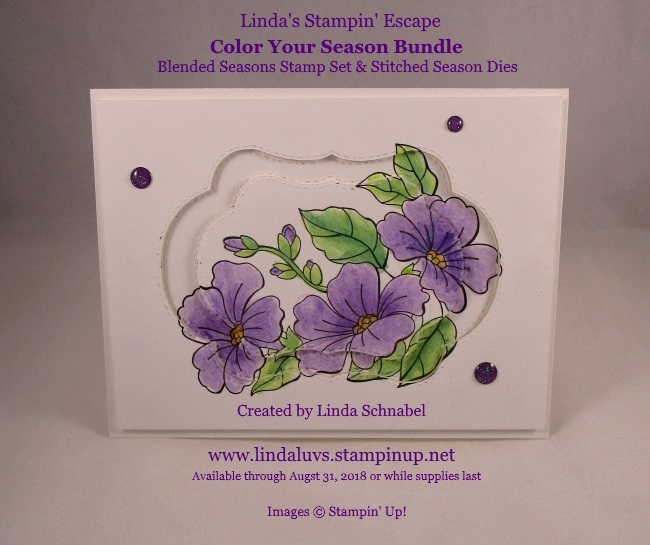 Today I have a quick little video that I created highlighted the collection of cards from the Color Your Season promotion that features the Blended Seasons Stamp Set and Stitched Seasons Framelit dies. I have 2 openings left for my Thursday night class … so contact me today if you’d like to join in the fun. I hope you enjoy … it’s a compilation of the cards I have shared with you and an extra one or two. This promotion ends August 31st, which means this is a Limited Time Only bundle or while supplies last. Bonus Days are back! Every $50 you spend in the month of August earns you a $5 coupon to redeem in September! It’s pretty awesome … Watch for an e-mail (SAVE IT) which includes your Bonus Days Coupon Codes! Then you can use your coupon codes to save in September when the Holiday Catalog is released. Two spots left for Thursday night … let me know (message me below) if you’d like to join us! The focus will be on maximizing your stamp set and dies. We’ll also have snacks and a whole lot of fun. Hope your Monday is a good one!! Because Stampin’ Up! is also offering a brand new set of Watercolor Pencils as a coordination product with this bundle I just had to play!! 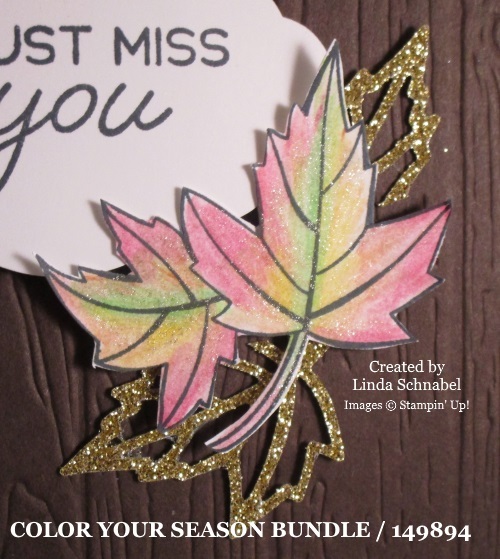 Who doesn’t love the ease of the Watercolor pencils when you want several different colors on your Autumn leaves? I stamped the images with the Momento Ink and began with the Garden Green Watercolor pencil. I used it along the vein in the center of the leaves, then I just colored in some Crushed Curry, then some Cajun Craze and finally a little Cherry Cobbler near the edges. Each leave was a little different. Once I was done with the Watercolor Pencils … I used my blender pen to move and blend the color. Wow … the pencils are definitely artist quality pencils, they blend so easily and looked beautiful in spots where I hardly blended at all! I did have to fussy cut my leaves out, but I must say that while sitting around the table with a group of friends (my Stars Team members) and just chatting & catching up, before we knew it, they were all cut out!! 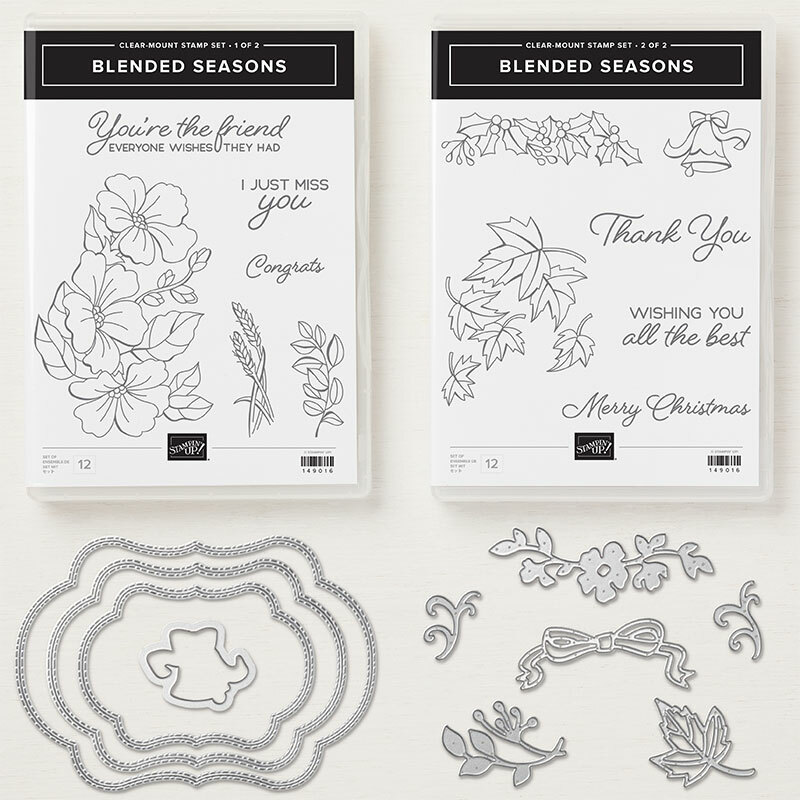 Our greeting comes from the Blended Seasons Stamp Set (see below) and was punched out using the Pretty Label punch! Popped it up with the Stampin’ Dimensionals and the leaves too. 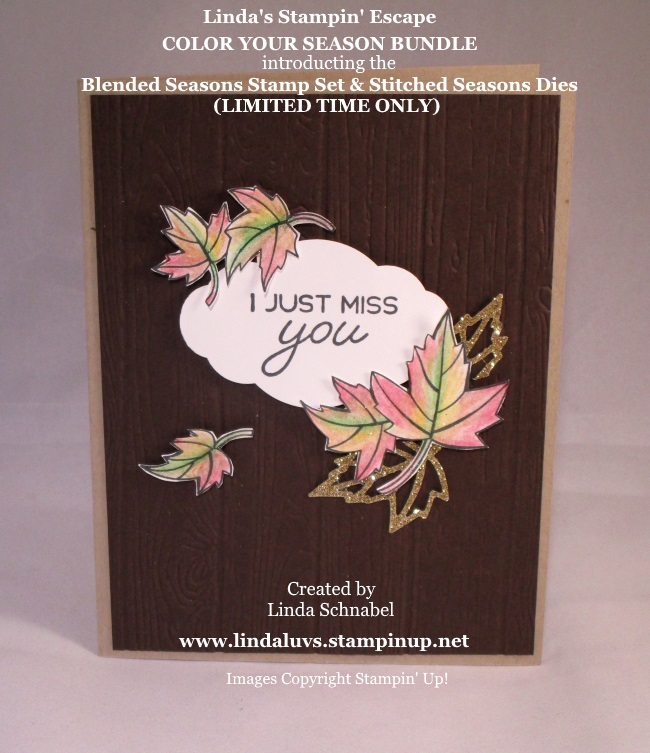 The background was done with the Pinewood Planks Embossing Folder … the autumn leaves look so good against it!! I can’t stop playing with this bundle … it can be used all year long and for any occasion (Even Weddings – there is a bell with a coordinating die)!! 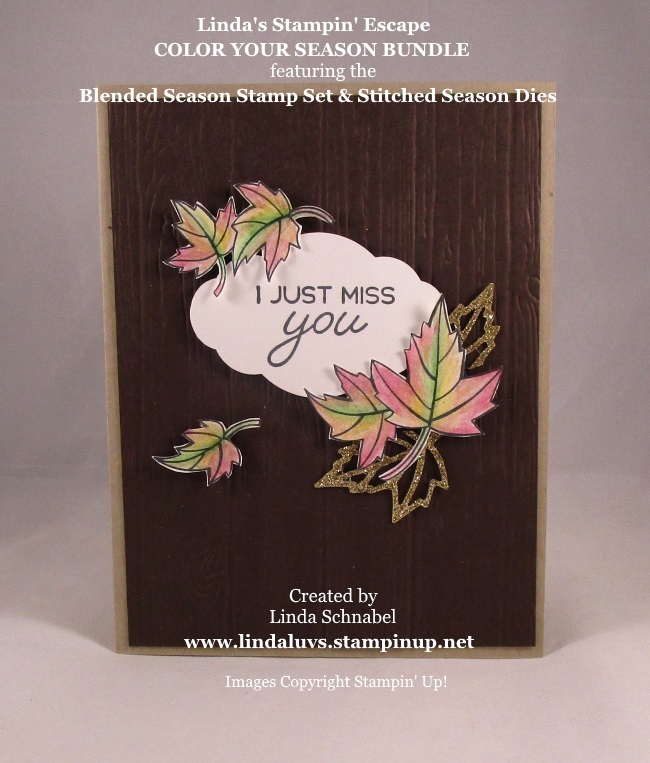 Stampin’ Up!’s® Blended Seasons Stamp Set, coordinating Framelits™ Dies, and Watercolor Pencils are perfect for every season of creating! Plus, save 10% when you buy the stamp set and Framelits in a bundle! But don’t wait—these exclusive products are only available until August 31 while supplies last. Today is a good day!! 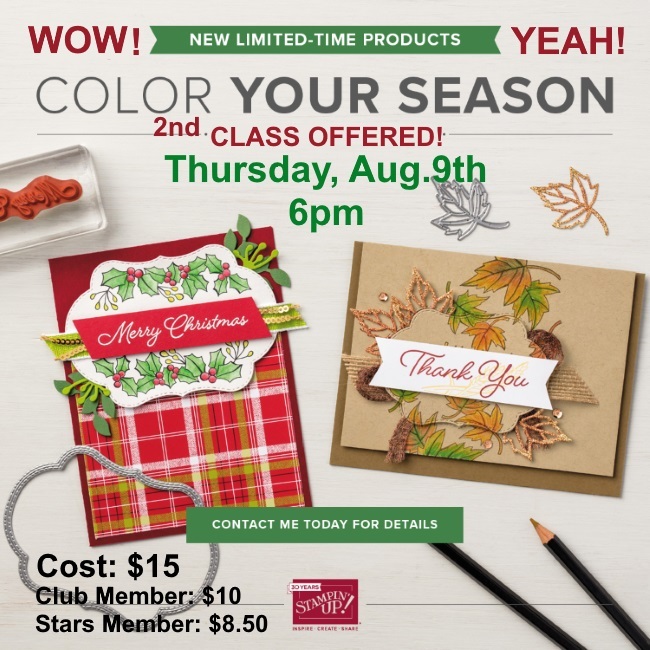 The Color Your Season promotion begins today! I have 2 cards for you from this amazing bundle. 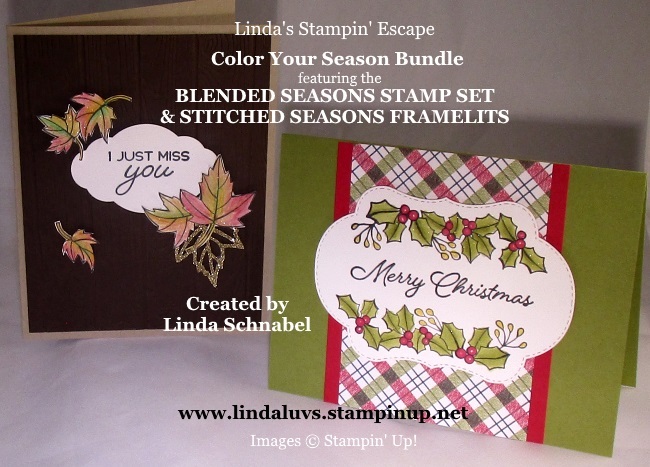 Stampin’ Up!’s® Blended Seasons Stamp Set, coordinating Framelits™ Dies, and Watercolor Pencils are perfect for every season of creating! Plus, save 10% when you buy the stamp set and Framelits in a bundle! But don’t wait—these exclusive products are only available until August 31 while supplies last. This card highlights the Watercolor Pencils with a light touch to add some soft violet tone to the flowers. Thanks for coming to check out the blog today. 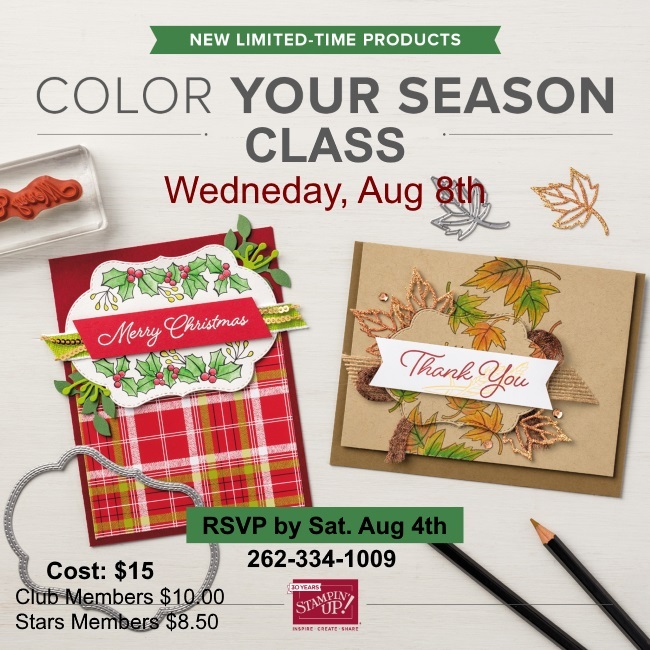 New Class Announcement: Color Your Season! 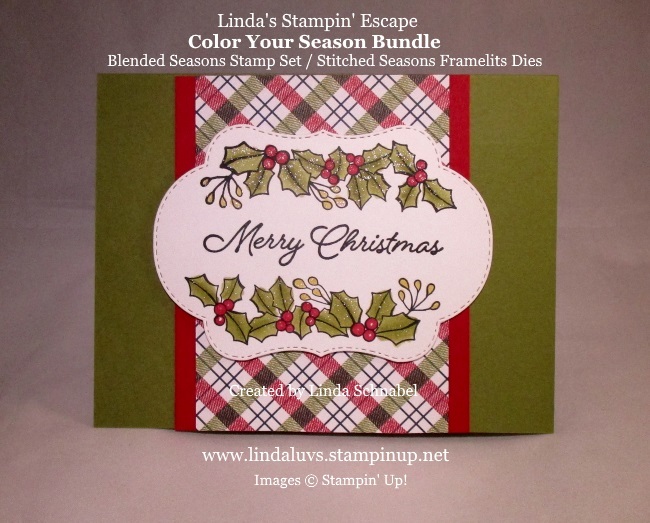 Plan on joining me … for a fun filled evening of stamping, snacks and making new friends! Plus you will go home with some amazing cards and great ideas to use on your cards! Thanks for stopping in today, I hope you have a marvelous day!